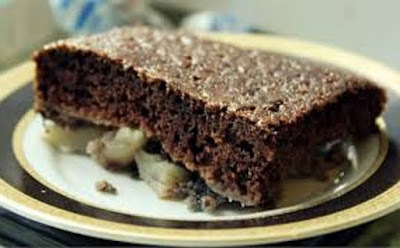 If you decide to cook Manna Cake with Chocolate, you can safely expect that the time for its preparation will take you about 3 hours. It is with a short break to ensure that managed to swell semolina, which is one of the main ingredients. In one portion such treats contains about 300 kcal. The container must be prepared to put semolina, sugar, vanilla and pour it all with water, stirring constantly. After thorough mixing the resulting mass is necessary to leave it for 2 hours to semolina swollen and become softer and well propeklas. Further, two hours later, to the mixture is added to butter, flour, baking powder and cocoa. Prepared pan grease with vegetable oil and pour the batter into it. Bake at a temperature of 180 degrees for 40 minutes. Massa, who received the addition of oil is desirable to pass through a sieve that would rule out the presence of lumps. Flour before adding to the dough as it is necessary to sift. The dough should be like thick cream. If it is watery, it is necessary to add a certain amount of flour.